Now that the official list has been anounced; it’s time to react to it. Today as a fan; I feel a great evil has been let out. I feel that some of the dark inner truths that maybe should have always remained secret are never sacred again. 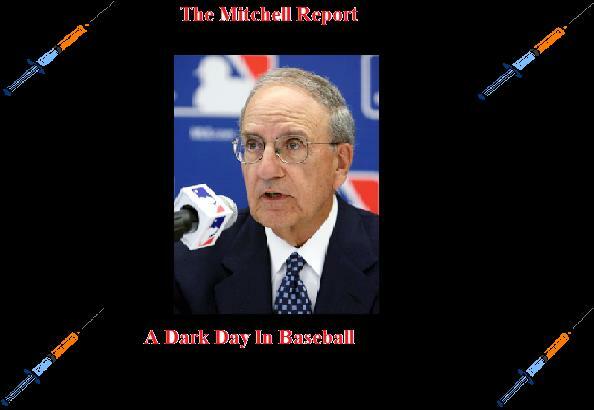 What did this Mitchell report accomplish other than generating immense interest and hype? Other than ousting players and shaking a proverbial finger at the sport, what really has changed? It’s not that I don’t agree with these events taking place, because I do. Honestly the witch hunts are going to continue. Just because some 80 players were named, doesn’t mean that players will stop using or that everyone has been outed in their guilt. I keep thinking about what is going through the minds of certain players and figures of the sport’s past on this evening. Is Clemens sulking in his shame? How about local star Kent Mercker? He’s spent a lifetime being a feel good story from central Ohio. Is that now somewhat tarnished because he was listed in the report? Hal Morris? I watched Morris at Riverfront Stadium as a kid; Hal Morris can’t use steroids or performance enhancing drugs–this guy wore a windbreaker in one of his baseball cards. I think that you have to go on a case-by-case basis. You can’t simply say that because guys like Mercker were listed on the same report as Barry Bonds, that they’re both intraveneous users of steroids; which is the perception many will get automatically. Also, in the past I’ve brought into question whether or not players like Adrian Beltre and Todd Helton were guilty of using steroids. Just because they were not named, doesn’t mean that they are in fact innocent. Mitchell and his Deca-seeking henchmen simply couldn’t catch everybody; they never will. -I thought it was interesting that I hit a few guys dead on that no one else did. One in which I give myself a lot of credit for is Todd Hundley. I was the only person I’ve ever heard to name Todd Hundley. Jerry Hairston would fall into this category as well. -As for guys that aren’t as mainstream that I’m not surprised about? In other words, guys I’m shocked I didn’t think of: Josias Manzanillo, Jack Cust, Denny Neagle, Chuck Knoblauch, Kevin Young, Paul Lo Duca, Gregg Zaun, Mike Lansing, and Glenallen Hill. -Where the hell were the following guys on the list? Ron Gant, Albert Pujols, Dave Stewart, and of course Helton and Beltre. -Complete shockers for me? Mercker, Hal Morris, David Justice, Fernando Vina, Brendan Donnelly, Ron Villone and Mike Stanton. -I thought the list had a bunch of guys that were no-brainers that many failed to mention in leading up to the report: Kevin Brown, Roger Clemens, Andy Pettite, Lenny Dykstra, David Segui, Brian Roberts, Eric Gagne, and Miguel Tejada.